Have you ever heard of Little Dresses for Africa? I bet many of you have, as it’s a very popular charity in sewing circles. But what you might not know is that there is a branch of this charity that collects handmade clothing for BOYS – Britches for Boys. 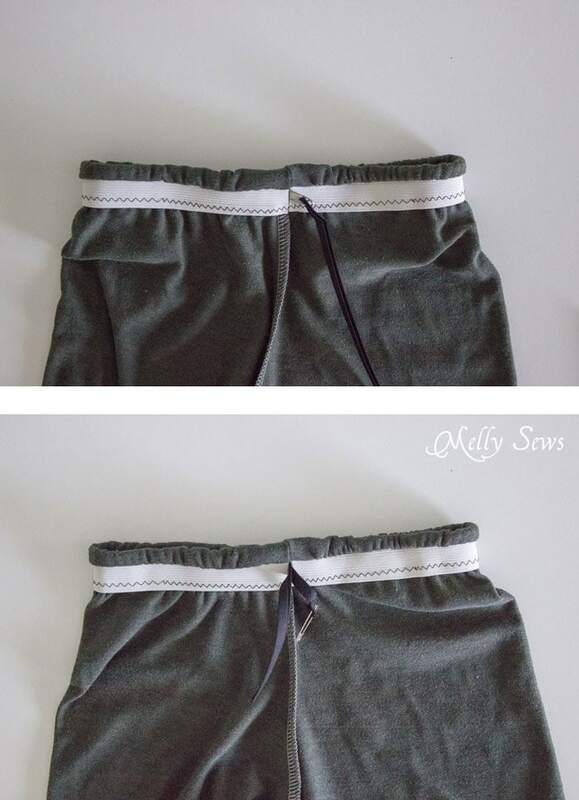 They particularly request drawstring waist shorts, so today I’m going to share how to sew a drawstring elastic waistband on shorts made from a t-shirt. The best part? These shorts can be made without a pattern! Maybe I’m just more aware of it since I’m a boy mama, but a lot of times (not just in charitable sewing) it seems like boys get left out of sewing as people sew cute pillowcase dresses and other projects for girls. So I was delighted to find these instructions for Britches for Boys. However, even though the instructions were very good, I didn’t have drawcord elastic and so the instructions didn’t quite make sense for that part. 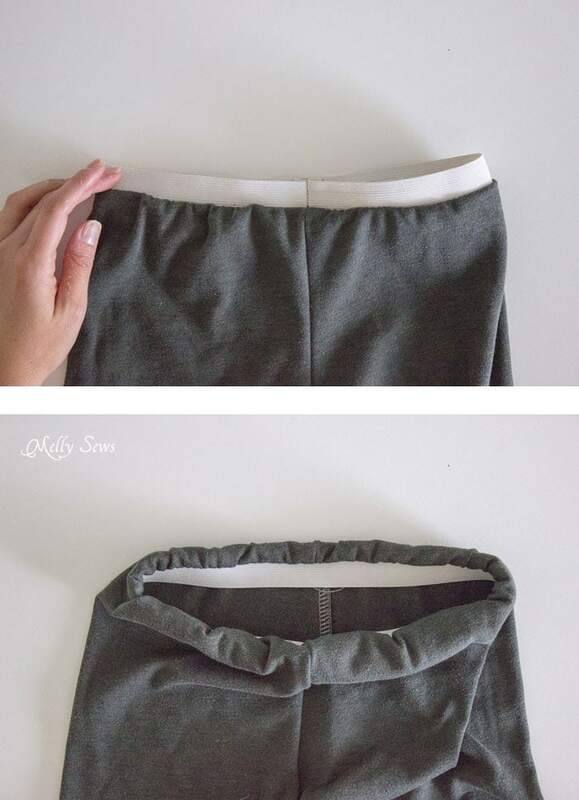 So here I’m going to show you how to do the waistband with regular elastic – and still add a drawstring. 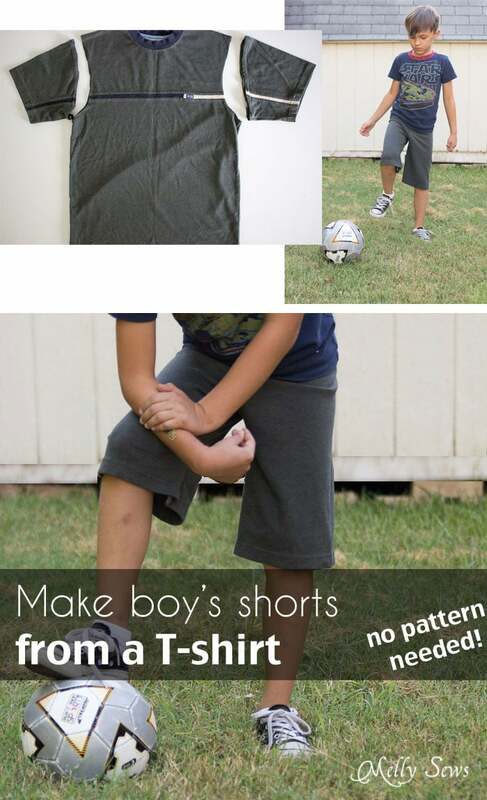 To start, get a t-shirt and the Britches for Boys tutorial (if that tutorial link doesn’t work try this one). If you’re not sure how much elastic to cut for the waistband (and the tutorial isn’t very clear on that) use the size charts for waist sizes in my shop here. 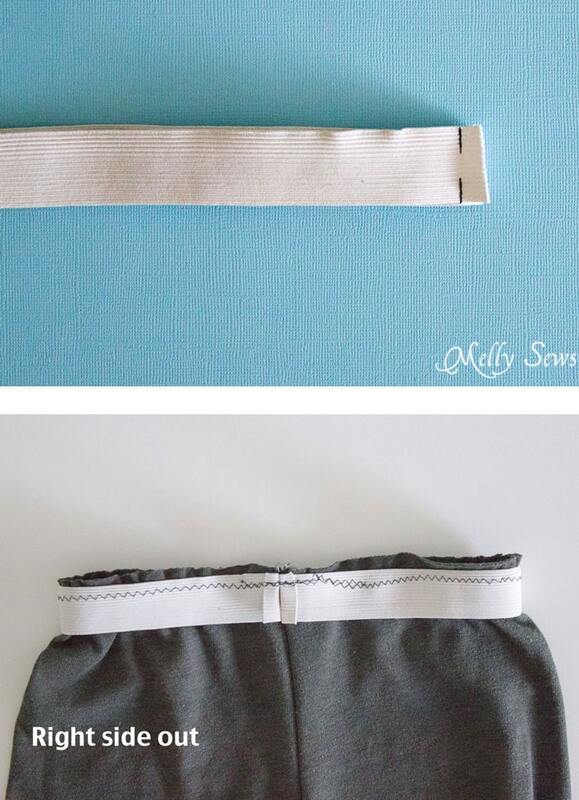 Cut the elastic to the larger waist size for the size you’re making. Ok, after you sew side seams and rise seams, it’s time to sew on a waistband. Fold 1 inch wide elastic in half, matching short ends. Sew together with a 3/8 inch seam, leaving a 3/8 inch gap in the middle of the seam. Backstitch each edge so that they will stay together. Press the raw elastic edges away from each other. With shorts right side out, place the elastic right sides together with the shorts, matching the top edges. The seam on the elastic should be lined up with the center front of the shorts. Pin at side seams and center front/center back. Stretch the elastic as you sew right along the edge (with a zig zag stitch) so that it matches the width of the shorts. If this stitching ends up a little messy, that’s OK as it’s going to get hidden in the next step. Fold the elastic to the inside of the shorts, so that the fabric edge you just sewed folds over the elastic. Keeping the fabric tight against the elastic edge (but not so tight that the elastic creases) stitch along the bottom edge of the elastic waistband to complete the shorts. Using a safety pin and your drawstring cord (I used bias tape for the cord in these) pull the drawstring through the channel you’ve created between your elastic and the shorts fabric by going in through the gap you left in the center front elastic seam. Knot the ends of the cord together and you’re done! And this way, kids who are skinnier can still keep their britches up. By the way – if you also happen to want to sew simple dresses for girls to donate, my friend Autumn has a tutorial and free pattern you can use here. That is so slick and so easy! Thanks for sharing. woah, that is clever! Thank you for my new pj bottoms method! Super handy for a quick pair of summer shorts! Thanks! You are a lifesaver. Both my boys have outgrown the mass of PJ shorts I made last winter and I have a whole pile of tshirts in my recycle bag. Yay for easy and cheap. If I end up with some extras I will donate to our local abused womens shelter for the kiddoes. I haven’t tried it yet but thank you for this post. I have one question: the front rise and the back rise being identical, will this short be comfortable? I thought that the back rise needs to be longer for better fit and comfort? Normally, it would be an issue. But with a long rise like these shorts have, you get a dropped crotch, and that allows you to make the front and back rise the same length. If you want to adjust for a crotch that fits closer to the body, I would suggest lowering the front rise 1″ at the waist. Very clear and informative. Thank you!